As you can see, it's a milky "white out" pink, very stark but also very cool. I like the way this stands out. It's a deep dark espresso shade that looks super rich. It also doesn't make my hands look red! Bonus. And, here's some random swatches just because. Following the brown trend, here's Borghese Espresso Brown F. I love the brush in this, it's the perfect shape! Maybe if the OPI Pro Wide brushes were shaped more like this they'd be easier to use. It's apparently two small brushes next to each other, but it's slightly rounded on the ends. It fans out perfectly at the cuticle and makes just the right shape. Misa Moody Model. Like melted milk chocolate, right? Zoya Pasha. I'm not sure what color this is, but I love it! Is it grey? Taupe? I have no idea. Whatever it is, it has this fine silver frost running though it that in certain lights gives the illusion of a blue reflection. Extremely unique, in my opinion. Here's Pasha with a thin coat of Zoya Sparkle Gloss topcoat. Sparkle gloss is really interesting, it has very fine flat flecks of shimmer that look white. It's really sparkly but it doesn't look glittery at all. It almost reminds me of the edible glitter I used to use when making cakes. Urban Decay Id. I tried to capture the green reflection in this, but I don't think I did a very good job. This color is amazing, it changes from gold reflection to green reflection depending on the light. Lots of pretty gold shimmer, and it has a "jelly" finish to it. Why on earth did they discontinue these?!?! They were awesome! Petites Dare. 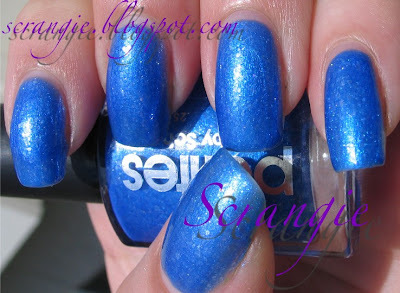 This is another polish that has those flat glitter flecks. They look like tiny pieces of chopped up cellophane or something. I'm growing fond of these flaky-looking glitters. What other brands have some good "flaky" glitter polishes? I have CND Limelight, but I need MORE!! What are your favorites? I never get tired of your "random swatches"! Passion 4 Fashion is my fav! Want. Zoya. PASHA! I have a huge affinity for ambiguous, "corpse nail" polish colours, like how others get excited about purples and reds. It's not limited edition, I hope? Kittylamour, No, I haven't tried it! I'd love to see pics. Sounds awesome! Oooh love the Id, it reminds of a more awesome version of Sally Hansen Sunrise Sunset, it's a vibrant orange-y coral with green duochrome & golden glitter. Applies beautifully as well. I completely LOVE Id. I got it as a Bday present when I was a Freshman in high school (so...7 years ago). I just found it the other day but haven't used it again yet. It looks so gorgeous on you, you've definitely inspired me to use that very very soon. I also feel the need to pick up Borghese Espresso Brown! Very unique and pretty! Where do you get Borghese polishes? AD, I'll have to keep my eye out for that Sally Hansen! I'm guessing it's discontinued, but it sounds amazing! Grace, I don't know what compelled Urban Decay to discontinue those polishes... It's what made them famous! They were all so cool, I wish they'd bring them back. You should try a Borghese! The Espresso Brown is my first one and I love it, they apply so nicely. Oops, I got my Borghese polish at Ulta, but they also have them at CVS! Hi!! I love your blog Scrangie!! Your pics are so helpful!! Pretty Please could you do some turquoise swatches? Oh and re Mad Minerals, have you tried Silk Naturals? They do fantastic m/u, I highly recommend, boom e/s (dupe of shroom), devine kiss bliss gloss & the perfecting powder. I can definitely put together some turquoise swatches! Id! I love that polish and mine is hitting bottom. I was wondering if you've found any good dupes for it? 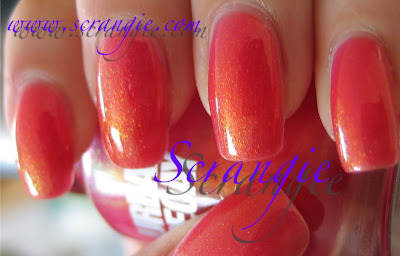 I've been using Sally Hansen Sunrise, Sunset but its not nearly close enough for me. Hey Diana :D I don't have a perfect match for it, but Rimmel Play Fast in Out Of Control with a thin coat of OPI Fireflies on top kind of simulates the color and duochrome effect. It doesn't have that nice jelly texture though :( I love Id so I'm going to keep searching for a good dupe! OMG! I am lemming after ID and i am kicking myself as i picked this up in my local market and then decided on getting Urban decay exhaust nail polish instead.The urban decay and hard candy nail polishes there are only £2 (i got hard candy sky :D) so i'm defo going have to go back to get ID now before it goes. New Rescue Beauty Lounge Colors! Reminder: Three Free Nail Polishes From Zoya! Special Surprise From Zoya: FREE POLISH!! !